One of my favorite pieces of 20th century music is Alban Berg’s hauntingly beautiful Violin Concerto. The Violin Concerto is in 4 sections, with no break between them. We’re only going to look at the last section, where an unusual Bach chorale speaks to us in a 20th century voice. Berg combines serialism from modern music with a Bach chorale from the Baroque era. To me, this unexpected combination gives us the best of both musical worlds! Before we look at the concerto, let’s learn a little about the two primary sources Berg used: Serialism and Bach. One form of serialism is the “twelve tone technique”. As the name implies, twelve tone technique essentially gives all twelve notes equal importance. Tonality, by contrast, emphasizes one note as the “tonic” or “home note”. Another name for twelve tone technique is dodecaphony. A particular sequence of the twelve tones to be used in a specific composition is called a “tone row”. As you can see in the example, a tone row includes every note of the chromatic scale exactly once, and no note is more important than any other note. Once a tone row has been created, a composer creates an entire piece based on this sequence of notes. One of the reasons composers developed serialism was to break away from tonality and its reliance on major and minor chords. Berg, however, uses a tone row which includes a series of major and minor chords! The four chords outlined are based on G, D, A, E. These notes are also the four open strings of the violin. The main section of his tone row has been carefully created to work well with his solo instrument. The end of the tone row takes us to a new world – the first 4 notes of the whole tone scale. We shall soon see how this tone row is related to the Bach chorale. The Bach Chorale “Es ist genug” is unusual because it begins with the first four notes of the whole tone scale. These four notes outline a tritone. Whole tone scales and tritone arrivals were not hallmarks of Baroque writing! “Est ist genug” is a chorale about death, and about the soul’s joy of reaching heaven. “It is enough! Lord, if it please Thee, my Jesus, come! World, good night. I go to the heavenly house, with a heart full of joy. 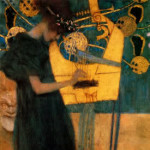 My sorrows remain below.” The first four notes would have been almost outrageous for that time period, had it not been for their interpretation as a musical figure depicting the soul’s crossing over from life into death. Berg subtitled his concerto “To the Memory of an Angel”. The angel he was remembering was Manon Gropius. Manon was like a daughter to the childless Bergs. Berg’s wife even kept a picture of Manon by her bedside. By all accounts she was a lovely child, much beloved by all who knew her. Tragically, she contracted polio and died before her 19th birthday. Berg was working on his opera Lulu when Manon died unexpectedly. He set aside the opera to work on a violin concerto, dedicated to Manon. He was greatly affected by her death and poured his grief, anger and finally, acceptance into the new work. The two movements each have two sections. Taken as a whole, the piece outlines a journey from life to death and finally to divine radiance. Both sections of the first movement represent life. The two sections of the second movement represent death and then the calmer, more peaceful acceptance and transfiguration.